An ideal position in the breathtaking town of Positano, Residence Alcione is located across the street from the prestigious Le Sirenuse Hotel. Enjoy the same view as this 5-star hotel while having the convenience of a furnished apartment � all at a more economical price! You are sure to find the accommodation that is just right for you � Residence Alcione offers eight different apartments of varying sizes and amenities! 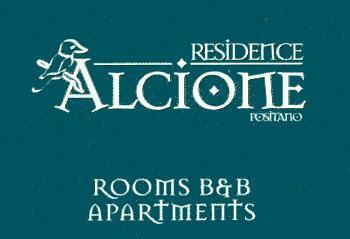 Enjoy your stay at Residence Alcione and become one of its treasured clients who return �home�, year after year! One apartment has a tub with shower. The other has a whirlpool tub and also a mini-kitchen. On the first floor there are two lovely, large-sized one-room apartments. Each has a large, sea view terrace, television, air conditioning and mini-refrigerator. The third floor offers four, gorgeous, recently renovated suites. They all have very large sitting rooms with sea view terraces, queen beds and small, full kitchens with dishwasher. Each suite has a full, beautiful bath with whirlpool tub and shower. Two of these suites can be connected internally and two can be connected via the terraces, in order to create larger accommodations. And of course, all four have air conditioning and television. The second floor has a large one-bedroom apartment and a charming two-bedroom apartment. The two-bedroom has one bedroom with queen bed and a sea view terrace and one bedroom with two twin beds. There are two bathrooms � one with a tub and shower and one with shower only. There is a small, full kitchen and dining room. Both second floor apartments have air conditioning, television and washing machine. The one-bedroom is a large bedroom with queen-sized bed and a sea view terrace. It has a very spacious living/dining room also with a sea view terrace and an ample-sized kitchen. The bathroom has a tub and shower.